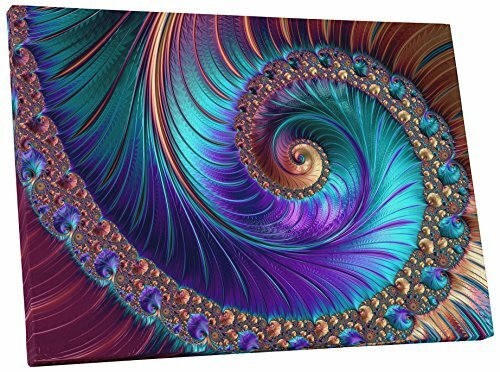 Pingo World 0719QSRRTTA ''Peacock-esque Spiral Abstract'' Gallery Wrapped Canvas Wall Art, 30'' x 45'' by Pingo World at Tecac. MPN: 0719QSRRTTA. Hurry! Limited time offer. Offer valid only while supplies last. Peacock-esque Spiral Abstract Art. Gallery wrap on archival quality canvas using Epson Ultra-Chrome inks and pine wood frames. Quality Guaranteed. Peacock-esque Spiral Abstract Art. Gallery wrap on archival quality canvas using Epson Ultra-Chrome inks and pine wood frames. Quality Guaranteed. Brand new, made to order. Top Quality Fredrix Archival Canvas. Epson Printers and Inks. Professionally stretched around 0.75" thick pine wood frames. Shipped in custom made boxes with protective sides. Comes Ready to Hang. Free Shipping. Life Expectancy Over 100 Years. Money Back Guarantee. 100% Made in USA. About Our Products We pride ourselves on using only the highest quality materials that produced in USA. All of the materials we use are sourced from US-based vendors, we do not buy from China. All of the images are printed on latest industrial wide format Epson printers. We use exclusively top of the line Fredrix brand Cotton canvas. Our wood frames are sourced from California and are cut to our specifications by the local mill factory. There are lots of different ways to put a canvas on a wall. At PingoWorld, we believe that your journey with us begins long before your artwork arrives at your door. We believe in using some of the best material available to insure that your experience with your art is superlative from the first day through decades to come. It all starts with the work of art, regardless of it being the Mona Lisa or your child on a beach! Our group of graphics experts uses industry leading software and techniques to make sure the image is transferred in the highest possible resolution, color correctness and vibrancy. If you have any questions about this product by Pingo World, contact us by completing and submitting the form below. If you are looking for a specif part number, please include it with your message.